When making a large party where there will be a buffet table and lots of food, advanced planning and organization can make things run smoothly and enable the hostess to relax and enjoy her guests. Here are Sarina’s Party Planning Tips. Menu – Decide on a menu and make a shopping list. Separate the list by the stores you need to go to for the list of items. Try and minimize on things that require a good deal of same day preparation or items that have to be served right away. You want to be able to enjoy your guests and not worry about over or undercooking something. Make Ahead and Freeze – With your menu decided, decide which items can be made ahead of time and stored in the freezer. These items should be prepared first. Order Ahead – any items that are going to be ordered should be done at least a week or 2 ahead of time. Things on this list might be specially prepared cookies or a fancy cake that will be the highlight. 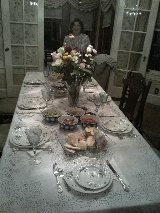 Simplify – Think of adding things like trays of cheeses and crackers, olives and pickles to enhance the table with color. They are easy to put on a platter and serve and require no preparation. Hire Help – You want to enjoy the day, so having someone in the kitchen to watch food, refill platters, pick up the dirty plates and dishes is important. Organize the furniture. Move things out of the party space that you don’t need or are valuable. Set the table. Put table cloths on the table. 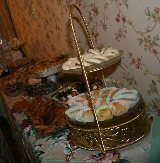 Add interest by placing small but sturdy boxes or containers under the tablecloth to give the buffet dimension. Place these near the centerpiece, leaving the outer edges of the table without height. Decide where you will place all the items on the menu. 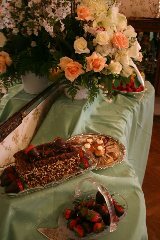 Think about the placement of plates and flatware, the desserts, the beverages. .
Identify serving pieces for each item on the menu. Write the name of each food and place it in the serving piece. Then arrange each serving piece on the table being sure there is enough room for everything. Leave space for your centerpiece. Place hot plates on the table for hot food. Go through your menu and identify anything that can be made one day ahead. What vegetables need to be cut or chopped? Place each in a separate Ziploc bag in the fridge for easy day of preparation. Make salad dressing the day before. Many salads can be made a day ahead –like tuna, bean, and egg. Peel garlic, squeeze lemons, chop onions, place meats in marinade, etc. Go through the menu and any item that can be cut up or squeezed a day ahead, do so and store in the fridge. Do any last minute shopping. The table is set, the shopping is done, now let’s get it on the table. Timing is of the utmost importance. Take Time to Prepare Yourself – Give yourself an hour to relax and dress before guests arrive. Have a list of Day of to do items and figure out how much time you need for these preparations. Hired Help – be sure hired help is given directions. Decide on the timing of food. When will guests be expected? What time do you want to open the buffet? Which things go in the oven and how much time does each take? This will determine when you start actually putting food on the table. Start putting out salads (add dressing right before guests come) and as much food as possible two - three hours in advance of serving guests. Get things in the oven that need to cook or heat so when they are placed on the table, they are hot.